When I was a kid a common snack was rye bread, cheese and jam - that sweet/savory combination typical of eastern european food. Of course all I wanted was spongey Wonderbread and store-bought jam, hold the cheese. I wanted to be like everyone else. Little did I know that as an adult I'd be all over anything NOT processed! But that sweet and savory mix is always yummy. This is an update on the bread/cheese/jam combo. Breakfast, lunch, snack - it works any time of day. Homemade labneh (a middle eastern cheese) sounds quite exotic but it's really easy to make by straining Greek yoghurt over night. It ends up with the consistency of cream cheese. Instead of jam, I made a rhubarb compote spiced with cinnamon, ginger and star anise. I'm wringing out whatever I can make from the spring rhubarb harvest. I know - still with the rhubarb! It's more sauce-y than jam-y and you can use it on crepes or pancakes or biscuits too. Use it in place of a relish or chutney with sausage or salmon or poultry. Sweeten is as much as you like - I tend to like it a bit on the less sweet side. Chop the rhubarb into larger pieces - they'll hold their shape better and there's aesthetics of course. Place a fine sieve over a large bowl and line the sieve with a double layer of cheesecloth. Place the yoghurt in the center, bring the edges together and twist closed. Cover with plastic wrap and place in the fridge overnight to drain. Stir sugar, water, ginger, cinnamon and star anise in a non-stick frying pan over medium heat for 2-3 minutes or until sugar dissolves. Bring to a boil and then reduce heat to low. Simmer for 3 minutes or until syrup thickens slightly. Add half the rhubarb. Cook for about 3 minutes til rhubarb is tender but still holds its shape. You don't want it mushy. Use a slotted spoon to transfer rhubarb to a bowl. Repeat with the rest of the rhubarb. Simmer syrup for 2-3 minutes longer until it thickens a bit more. Pour over rhubarb. Cool. Remove labneh from the cheesecloth. 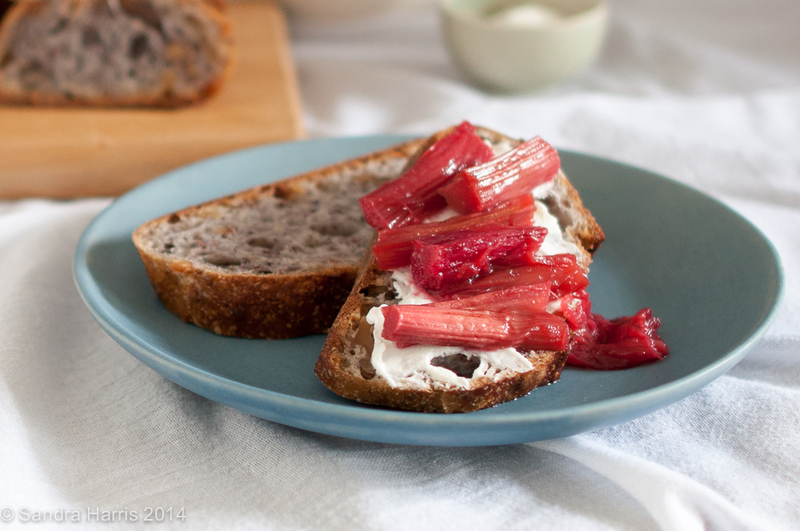 Spread over the toast, top with some rhubarb and serve.